Hi folks. We were once again successfully able to pickup all of the BreyerFest horses for our customers. The horses are currently in transit by car and will be back here in California on Friday. We will start shipping orders out on Monday, July 24th and anticipate having all of the orders shipped by the end of that week. We are also shipping Mid Year Releases orders. Some of the Mid Year Releases are shipping this week but the vast majority will ship next week when we have more hands on deck. Right now it’s just me at home! There was a production delay on Calavera and he is now expected to ship in August. Everyone was effected and no Breyer dealers (or Breyer for that matter) have this horse on hand. Please email us at aidanstoytrove@gmail.com if you ordered a Calavera through us. 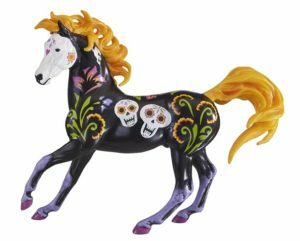 Shipping is additional if you want your Mid Year Horses shipped now and Calavera shipped when he is in hand. This additional shipping cost will be discounted for any that ordered Calavera before today. There is no additional charge if you prefer to have us hold your entire Mid Year Release order until Calavera is in hand and we can combine all of the horses together. Again, Breyer is saying that Calavera is expected to ship from them in August. I can confirm that there were no Calaveras at BreyerFest so there was definitely some sort of hiccup with his production. I flew 2 suitcases home full of BreyerFest Horses (and clothes, boring!) I posted videos on Aidan’s Toy Trove YouTube Channel of the suitcase unloading and unwrapping. Enjoy! « Breyer Zion and Moab – Web Special Run Susecion & Le Fire!